Danish language drama from 1998. During Helge’s 60th birthday party his children and friends holds speeches, drinks a little too much and must face difficult truths. “The celebration” is a Dogme movie, which means it doesn’t use any technology or special effects and rather tries to focus on story and acting. There is a focus on the acting and the story, but weather that would have been diminished by more light during the evening or breaking some of the other dogme rules, is difficult to say. “The celebration” has a good story and spectacular acting, so there might be something to this. This is probably one of the most I have cringed while watching a movie. It was on purpose on the movie makers side, and not because it was badly made. They made a set of horribly embarrassing scenes, and put together they form an important story. So, if you’re gonna watch “The celebration” get ready to blush, feel uncomfortable and awkward, and in my case at least, also shocked. The footage and audio reflects the “back to basics” idea of the dogma movies and served to tell the story and convey the acting, but no more. There was nothing spectacular, but also nothing unprofessional or low quality. It was all just a way of conveying the story to the audience. The acting was the storytelling in “The celebration”, and there was a lot of close and personal filming of raw emotional reactions, and it was painful to watch. There were many personal tragedies in this family, and they all come to the front in this birthday party. The story is important and made me reflect on the topic, and I presume that is the intent of the movie makers. I have not seen this topic tackled in such a way before, and it was well done, both how the story was constructed and how it reflected the subject matter. I like “The celebration”, and it was a well made movie, however, I will not watch it again anytime soon. It was just too painful to watch. I would recommend “The celebration” to anyone adult. It is an original movie about an important topic. If you’ve recently seen “The celebration” or you’re watching along with my year of movies, please leave a comment below with your thoughts on the movie or note down your opinion somewhere else. 48 movies down. 317 to go. If you want to get “The celebration” from Amazon, here is a link for that. They probably have the movie many other places too. Maybe it’s on a streaming service you subscribe to already? Tomorrow’s movie is “Man on wire”. Get some more information about this movie and the other movies on my watch list this week on the upcoming movies page. If you’re new to this site and are wondering why I’m watching a movie every day for a year, read more about my experiment. Until next time; live long and prosper. For a little bit more about these movies, visit my upcoming movies page. The experiment is over. 365 movies seen. What is a captain's log? I even had to feed some llamas. It all takes time. I also had to search for trolls under a difficult bridge. Takes a lot of time. Almost forgot today's movie, but with this view, can you blame me? 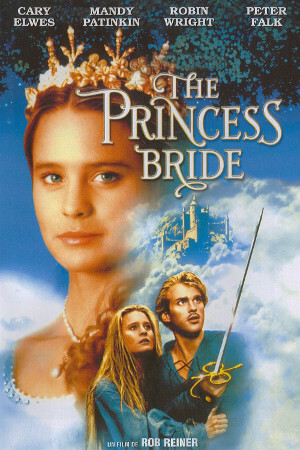 My favorite movie changes often, but right now it’s “The princess bride” (1987). Today is the last day of watching a movie each day for a year. Enter your email address to follow Dreamberry and receive notifications of new posts by email.